Acrok Video Converter is a powerful video conversion program that lets you effortlessly convert your video and audio files to and from virtually any regular video/audio format. Download it and follow the guide and learn how to convert and edit video and audio files. 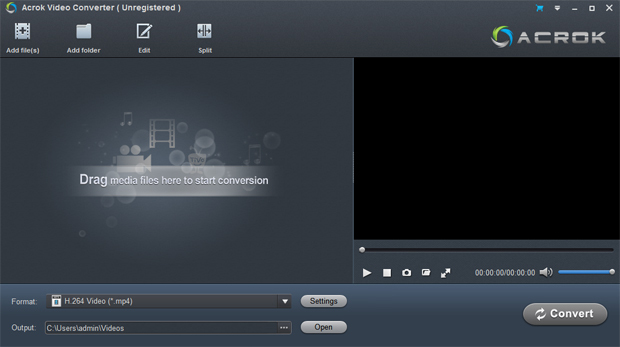 Acrok Video Converter is a very easy-to-use converter tool. You can get what you want within just a few clicks on the interface. Click the Add Files button on the main interface to load video or audio files from your computer or other devices like USB device, camcorder, etc. You can also directly drag the files you want to convert to the Acrok Video Converter main interface. Batch conversion is supported by this software, so you can add several files as you like at one time. If you like, you can choose any device as output. Here, you can convert any video to any video foramt for your Android/Windows/IOS devices, such as Galaxy Tab Pro, Galaxy Note Pro, Archos 101XS, Surface 2, Acer Iconia tablet, ASUS MeMO Pad FHD 10, iPad Mini, iPad Air etc. For playing movies on Panasonic Virea TV, Samsung Smart TV, Sony HDTV etc. Acrok Vdieo Converter can give you a hand. Tip 2. How to play videos Acrok Video Converter also acts as a perfect media player that lets you play videos in various formats. After loading the files, click the Play button the software will play your videos smoothly. While playing, you can take snapshots of your favorite movie scenes, enjoy fullscreen view, convert files, etc. as you like. Tip 3: If you want to convert Audio files via Acrok Video Converter. Just drag any music into this program, then choose a output audio format from "Common Audio" category. Acrok Vdieo Converter can help you convert *.au, *.mp3, *.mp2, *.m4a, *.flac, *.ape, *.ogg, *.8svx, *.aiff,*.aif, *.caf, *.dts, *.smv, *.tta, *.voc, *.aac to MP3, AAC, FLAC, MKA (MKA(Matroska) Audio), OGG (Ogg Vorbis Audio), WAV(Nokia WAV Audio), M4A, DTS (remux),MP2, AIFF, AMR, SUN AU Format.